Kathy Sundstrom and her kids were recently out for a drive in Victoria, Australia, when they had what Sundstrom describes as "one of the experiences of a lifetime" - and it's easy to see why. After spotting a koala in the road, they decided to stop, watch it cross and take a few photos. But those snaps apparently came with a price. For the next few moments, the energetic little animal scurried toward each of the humans, apparently trying to hug them like he would a tree. 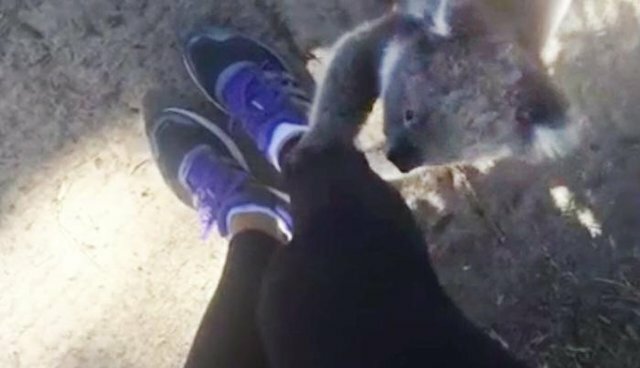 "Being mistaken by a koala for a tree at Cape Otway," Sundstrom wrote on Facebook. "It was crossing the road and we and several others stopped to let it cross and then it wanted to climb us." Fortunately, the little traveler eventually did find his way to the other side of the road where a real tree was waiting to better accept his furry embrace.